Lately the weather has been perfect for some hearty, winter meals. 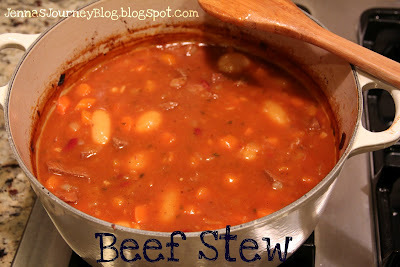 And what's better than a great stew? A quick note - you can use beef stew meat, that is prepackaged in the store, but be aware that while "stew meat" used to always be chuck, now it can be any mixture of any type of beef cut. So, you may have pieces that are more fatty, or that are a tougher cut of meat, which is why I highly recommend buying a chuck and cubing it yourself (or having your butcher do it). Heat a large dutch oven over medium - high heat. Add about 2T oil. Coat meat in salt and pepper and then sear. Remove meat with a slotted spoon to a plate. Throw out any remaining oil. Heat butter in pan, over medium. Saute onions for several minutes until translucent. Add carrots. Saute for about 4 minutes. Add garlic. Cook 1 minute. Add tomato paste, stir well. Add flour. Stir well, and then add your water. Combine. Add in all remaining ingredients (parsley, thyme, beans, tomato sauce, bay leaf), stir until combined. Place lid on pan, bring to a simmer. Turn stove off and place dutch oven into the oven. Cook for 2 hours or more, until meat is very tender. $100 Olive Garden GC Giveaway!